The VendTag™ unit is a cheap and simple cashless vending system that, once fitted to a machine, allows key holders a limited or unlimited number of free vends each day without effecting the machines normal “pay to vend” operation. Capable of being retro-fitted to a wide variety of vending machines, this simple system can be ideal for locations where you wish to sell product while retaining the goodwill of staff by providing them with free vends. Low cost cashless vending system. Capable of being retro-fitted to a wide variety of machines. For some it’s as easy as plugging the unit in to the coin acceptor socket. Integrated display shows the user’s remaining vends. Available with or without a plastic enclosure to allow a variety of mounting options both inside and outside the machine. Adhesive overlay included (own branding available on request). Restricting use of vending machines to authorised people. Especially useful in cigarette vending where the machine can be activated by a member of staff. By touching the VendTag cashless vending system with the user key, the unit subtracts one vend from the user’s daily allowance and gives an output pulse to the host machine. At the end of the day the the keys are re-credited with a fresh allowance. Each key allows the user 1 to 10, or unlimited, free vends per day. The system is capable of supporting up to 128 user keys. The unit is designed to be used alongside, or as a replacement to, coin validators with a NRI G13 parallel style interface. The VendTag unit can be plugged directly into the vending machine control board using the existing validator cable. If required the original validator can then be connected to the VendTag unit to allow continued pay operation. In this configuration the unit is powered through the validator cable. The unit works by simulating the insertion of a coin into the validator. The coin line (channel) can be selected on the board by using a jumper link. When the VendTag is activated by the user key, the unit pulses and credits the vending machine with the value of the coin assigned to that channel. The user can then use that credit to purchase from the machine. For machines that do not have a NRI G13 interface, the unit also has a built in relay output. Please note that this method of connection requires a 12VDC power supply. Pulsed operation: The relay will briefly pulse in a similar fashion to activating a switch. As an example, this can be used with systems that use mechanical coin mechs. Latched operation: The relay will activate and stay closed until the unit receives a reset pulse from the vending machine. As an example, the VendTag could could be wired to a “free vend” switch, putting the machine into free vend mode until the unit receives an “end of vend” signal from the machine. 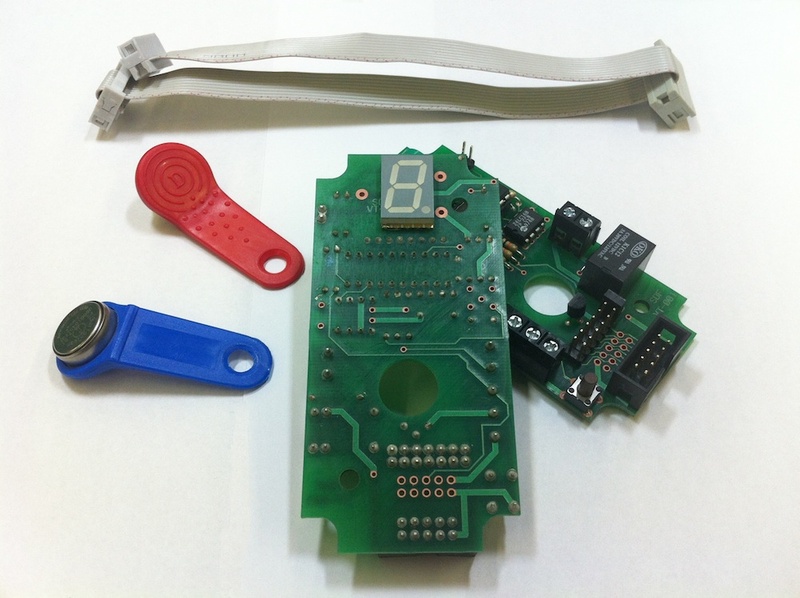 Due to the large variety of vending machines, the method of wiring the VendTag to any given machine can vary greatly. Our technical manual gives examples of wiring the unit in a number of different situations to give you an idea of how it may work for you. 1 x “Blue” master key (for programming user keys). 1 x “Red” user key. 1 x VendTag branded overlay. For further details, please feel free to contact us or leave a comment below.